Jay Galbraith was Senior Research Scientist at the Centre for Effective Organisations, University of Southern California and founder of Galbraith Management Consultants, probably the most well-known in the area of OD thinking and research. Creator of the “Star Model” a holistic approach to OD which shows the levers that managers can control to affect employee behaviour. By choosing the desired behaviour, managers can influence the organisation’s performance as well as its culture. Designing Dynamic Organizations: A Hands-on Guide for Leaders at all Levels 2002 A best selling how to guide with tools and worksheets, written from a practitioner’s perspective. 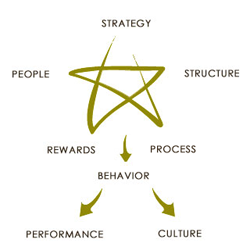 Designing The Customer-Centric Organization: A Guide to Strategy, Structure and Process 2005 A comprehensive customer-centric organisational model that shows how to put in place an infrastructure that is organized around the demands of the customer. Includes a tool that will help determine how customer-centric an organisation is – light-level, medium-level, complete-level, or high-level- and it shows how to ascertain the appropriate level for a particular institution. Designing Organisations: An Executive Guide to Strategy, Structure, and Process Organizing For The Future: The New Logic for Managing Complex Organizations 1993 Describes how to create an organisation with high levels of employee involvement and new roles for managers.